You know what they say, if you don't stand for something, you'll be nothing. There's also another famous saying, if you don't stand up for dorm room decoration, then your college dorm room will be nothing. That very famous saying may sound a bit harsh to you, but the walls of college dorm rooms are supposed to be decorated! Dorm rooms are your own personal living space that you can decorate any way you'd like. 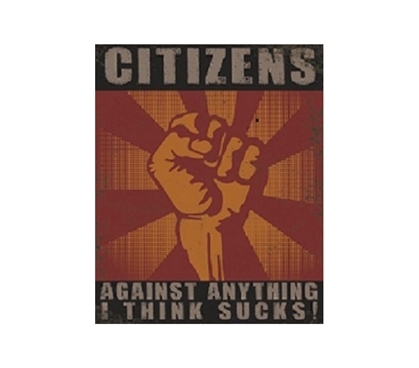 Our Citizens Against Sucky Things college Tin Humor Sign is a funny alternative to basic dorm room posters. College tin posters are not just for dorm room walls, they can also be hung on room or closet doors. When you first start living in a college dorm building it can be easy to forget where your room is on the long hallway. Hanging our tin sign from your dorm room door will not only let you know where your dorm room is, but it will also let everyone else in your hallway know that you are taking a stand against sucky things. Big college supplies like dorm room futons and rugs are important to have in your college survival kit, but it's the little things like dorm decoration that make your dorm room your own.